Erin graduated with a Doctorate of Physical Therapy from the University of Vermont following an undergraduate B.S. in Exercise Physiology. Her clinical experience has focused on orthopedics and sports medicine. She has also worked in acute care and geriatric settings. 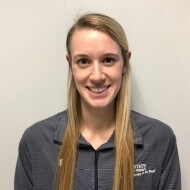 She is passionate about manual therapy, injury prevention programs and utilizing evidence-based practice to help each client reach their individual PT goals. Erin is originally from Vermont. In her free time she enjoys spending time with family and friends, hiking in the Green Mountains, running and playing ice hockey.